I'd have to thank my best friend and her boyfriend for mentioning this gem to us in the first place. I believe it's been a year since my husband and I have been going to this lovely Italian restaurant. I'm honest when I say that the exterior of the restaurant could use a little face lift, but I also think that's what makes this place so special. It's deceiving from the outside. It's a smaller setting, but there are quite a few tables and hidden back rooms that I swear I don't even notice until we go again. It's BYOB here, which, who doesn't love places like that? The tables are dressed with a distinct look of older Italian; for example, white table cloths and burgundy napkins. There's a basked filled with fresh white bread as soon as you sit down, with butter packets and an olive oil and fresh garlic dip. I'm not the biggest fan of butter packets at nice restaurants, but again, I think this place likes to keep things traditional and unique. It's charming in a way. The staff is welcoming and you immediately feel like you're part of the family. My husband is kind of obsessed with this place and whenever we do a date night, Ristorante Fieni's is usually the first place he mentions. I think we've been there maybe a dozen times at this point. I typically have gotten something different with each visit and my husband sticks with what he knows; but he's tried at least three different dishes there so far. Most of their food is so delicious that it can be hard to choose what to eat. *Each entree comes with their soup of the day or a garden or Caesar salad. The salads are prepared wonderfully. They'll ask if you'd care for fresh cracked black pepper. You should always reply with a YES. 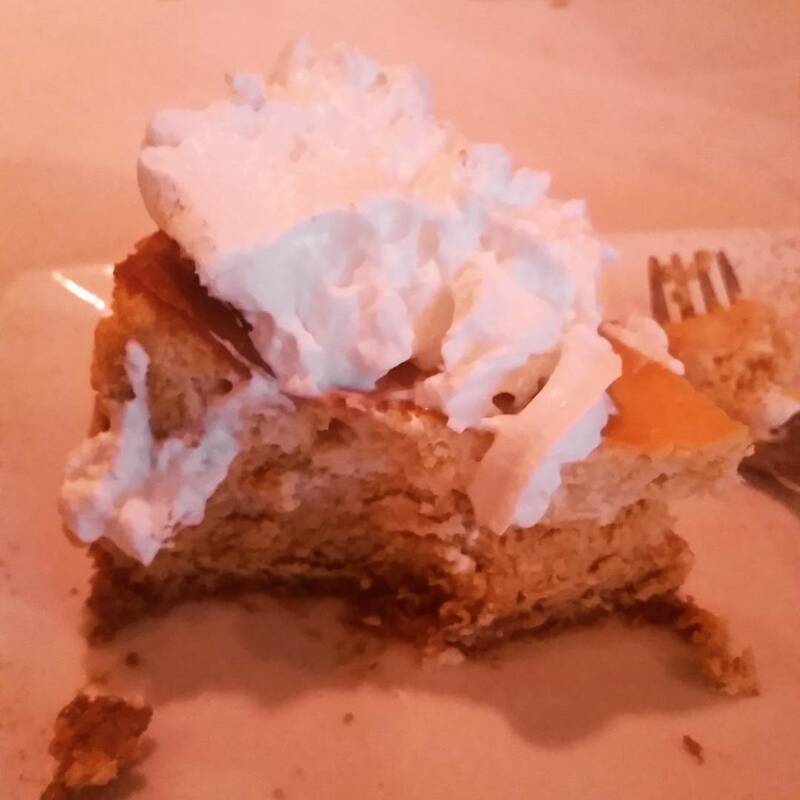 pumpkin cheesecake. Seasonal <--to die for! so creamy! Yup. that's a lot of dishes. And almost all of them are superb. They are also huge portions! Be prepared to ask for boxes. I think my personal two minor complaints so far are on the eggplant parm, I'd prefer the breading to be a bit crispier. And for dessert, I really want them to add chocolate chip cannolis to the menu. I feel cannolis are an Italian dessert staple and they still do not have them in-house. Maybe if I keep asking they will make it happen. ;) I just thought of a third one. They keep grated Parmesan cheese in a shaker on the table. I don't know about you, but I have always liked the added touch of the server grating a fresh block of Parmesan cheese straight onto my food instead. It's a very minor concern compared to the overall atmosphere of this place which is nothing short of wonderful. My husband and I had date night last night and we went here. I tried their eggplant parm for the first time and you can see my tiny complaint above, but overall it was tasty and I'd get it again. I had their garden salad and tried the pumpkin cheesecake for dessert. It was amazing. With a crumbly, buttery cookie crust, and creamy pumpkin spiced center, it was delectable. It was also huge and since my husband isn't a fan of cheesecake, I definitely could not finish it. I'd score this place a 9 out of 10 for consistent quality of food and a charming and welcoming atmosphere. 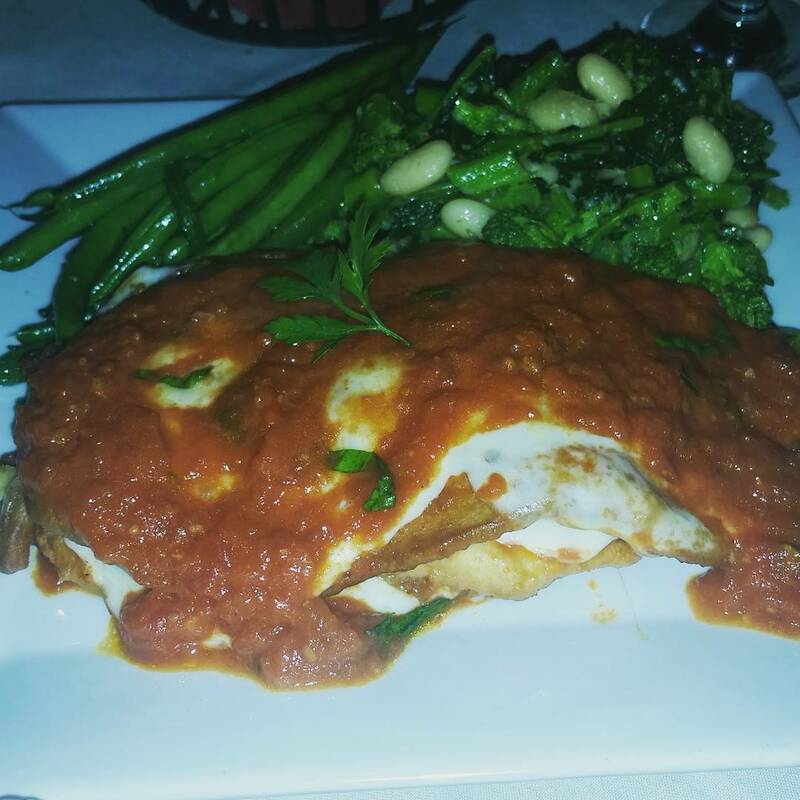 If you're ever in south jersey for a visit, you'll need to add Ristorante Fieni's to your eatery list. The Husband and I highly recommend it!